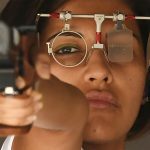 The year 2017 began on a grim note for pistol shooter Heena Sidhu. A finger injury, for which she had to undergo physiotherapy and painful treatment, meant that her fingers trembled while shooting. But the former World No 1 says she had to prove to herself that she could still succeed at the sport, which she took to as a hobby. “The injury was one of the best things to have happened to me. I told myself I know how to shoot. Eventually, there were matches in which I exceeded all expectations just because I did not give up,” says Sidhu, who holds a bachelor’s degree in dental surgery. Her belief in herself has worked wonders. The Arjuna Awardee clinched gold at the Commonwealth shooting championships in Brisbane, Australia, last October. This came on the back of three golds in mixed air pistol global competitions with Jitu Rai, including at the World Cup. Outside the field too, Sidhu made a statement when she refused to travel to Tehran for the Asian Air Gun Championships in 2014 and 2016 because Iran had made wearing the hijab mandatory for women participants. For now, she has set her sights on the Olympics, but prefers to take it “one match at a time”.